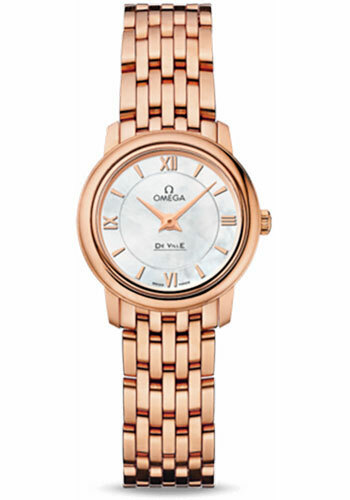 24.4 mm 18K red gold case, scratch-resistant sapphire crystal, white mother-of-pearl dial, quartz Omega 1376 movement, approximately 41 months of power reserve, 18K red gold bracelet. Water resistant to 30 m.
24.4 mm 18K red gold case, diamond bezel, scratch-resistant sapphire crystal, white mother-of-pearl dial with 8 diamond hour markers, quartz Omega 1376 movement, approximately 41 months of power reserve, 18K red gold bracelet. Water resistant to 30 m.